During the last four years, I have visited almost all parts of India and interacted with people from all walks of life- students, youths, farmers, scientists, engineers, technicians, doctors, medical staff, educationists, industrialists, armed forces personnel, spiritual leaders, political leaders, administrators, economists, artists, sports persons, physically and mentally challenged and the rural populace. What have I learnt from these interactions across the different cross-sections of Indian population? School children and youth also interacted with me through my website. They gave many suggestions on making India a developed nation and their role in achieving this mission. I would like to highlight a few of the suggestions, among the many, which I received from children and youth. One student from Meghalaya responded, "I enjoy teaching as it can shape children to be good citizens of our country. So I want to become a teacher or a soldier to defend my country". Another girl from Pondicherry said, "A garland can be made only with many flowers with a common thread. Therefore, I will make my countrymen love the nation and work for the unity of minds to realise the garland - Developed India". Another boy from Goa said, "I would become an electron and just like an electron in the orbit, I will work ceaselessly for my country". A boy of Indian origin based at Atlanta, responded, "When India becomes self-reliant and has the capability to put sanctions against any country, if needed, then I will sing the song of India, and I will work for it". The young boy meant that India should become a developed country with economic prosperity, accompanied with national security and political will. What noble thoughts from the young minds! These are only examples. The aspiration of young ignited minds to make the nation great is evident. It is important to recognise that India has a population of 700 million such young minds. This is a large force, which needs to be harnessed constructively towards a singular mission of making India a developed country. Like the young, every citizen of India I interacted with, would like to live in a happy, prosperous, peaceful and safe India. I have seen the beauty of our country in the deserts, mountains, seashores, forests and in the fields. India has a rich, civilisations, heritage, resource, talented workforce and above all there is potential due to the emergence of a knowledge society. Still 26% of our population is below the poverty line, illiteracy and large scale unemployment persist. While it is imperative to address these problems, it is also necessary to increase the economic growth. This can be achieved by an effective management of resources and manpower - our core competencies. Our Prime Minister during his address on the eve of Independence Day 2002, declared that India will become a Developed Nation by 2020. The tenth five-year plan also focuses on an economic growth of 8% and an employment potential of one hundred million. In my earlier book, "India 2020-A vision for the new millennium", written in 1998 with Shri Y S Rajan, we discussed the Technology Vision 2020 by TIFAC, which was evolved with the help of 500 experts. In the last few years, there have been significant developments and technological revolutions Now a consensus has emerged in all the sections of the society, particularly among the youth and children, to live in Developed India and take appropriate actions. Even the Indian families living abroad have expressed their desire participate in missions to transform India into a developed nation. In view of the above, a need has been felt to write this book. 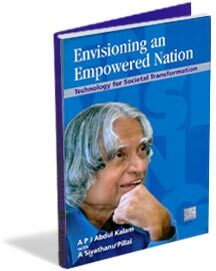 This book goes into the specific details pertaining to the impact of technology on society, and the missions leading to a Developed India by 2020. When we were developing rockets, launch vehicles, missile systems and related technologies in India, the developed world denied technology, for many reasons, to us. This resulted in challenging the young minds into action. Technology denied is technology gained. Today, India has core competence in system design, system engineering, system integration and system management of launch vehicles, missiles and aircraft, and capabilities for developing critical technologies. This book brings out these aspects in an integrated manner through two important case studies on the design of a launch vehicle and a guided missile. Our aim is to convey that just like science, we have to make technology a universal system, decoupling geo-political policies. These case studies pertain to our experiences of working at ISRO and DRDO, and with great technology visionaries- Dr. Vikram Sarabhai and Prof. Satish Dhawan. India has many successful experience of managing mission mode programmes. We recognise the importance of technology and the role that it can play while formulating policies and implementing programmes in mission mode. The requirement today is the creation of a suitable environment in tune with the times, and India’s transformation into a knowledge society. For harnessing the potential of the youth and the resources, creative leadership is essential. Networking of thoughts and deeds of one billion people towards a common goal of making India a developed nation is indeed the need of the hour.